Donations come down to much more than money. Your generosity directly supports life-changing efforts that result in long-lasting, community-wide change. Volunteers change lives in our community. They willingly share their time and talents as tutors, mentors, fundraisers, and much more. Launch a workplace giving campaign, where employees make a difference by contributing to solutions that improve our communities. Set up a personalized fundraising page with your friends and family to see how your passion can impact our community. Join us for our unique community events, where we volunteer, share success, and celebrate the impact we are making together. Has your life been impacted by giving or receiving support? Sharing your experience helps us understand the issues in our community. Members of our Donor Networks work together to share ideas and serve our community. They cultivate personal, professional, and philanthropic networks to be our community’s most dedicated donors, volunteers, and advocates. 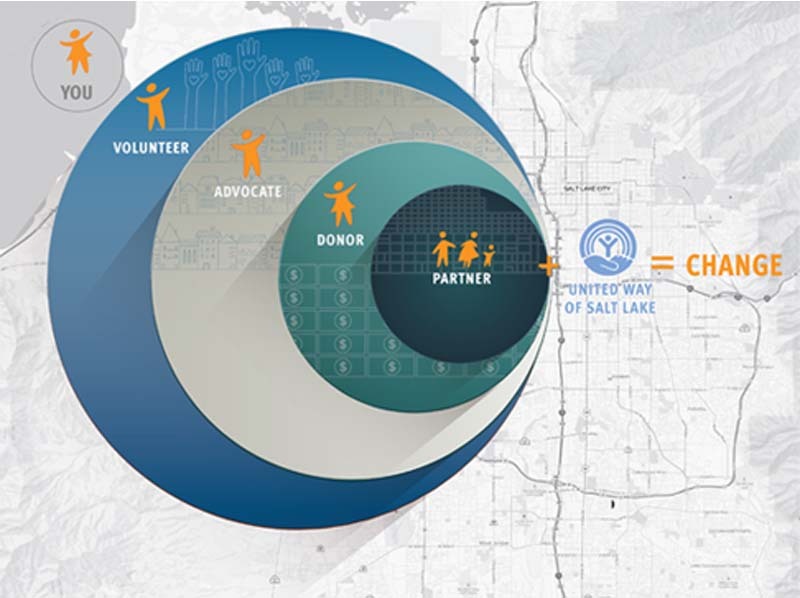 Donors who give at a leadership level give $1000 or more annually and believe deeply in the work of United Way of Salt Lake-- to create lasting change in our community. Women United members engage their power, wisdom, and generosity to empower girls and young women to reach their potential through education. Young Leaders are philanthropists under 40 who are focused on supporting early education, networking with peers and leaders, and building leadership skills. Tocqueville Society members are dedicated philanthropists who demonstrate generosity and outstanding commitment to our community by investing $10,000 or more annually. We believe that no problem is too big that we can’t solve it together, but it takes all of us: fundraisers, handraisers, changemakers, partners, and YOU to create lasting change.